Very few people realise just how close we came to a recession in the past 12 months, purely on an economic indicators perspective and not counting external risks such as the Fiscal Cliff debate. However, many traditional long leading indicators based on for example the yield curve and the unemployment rate, belie just how close a shave we had. This is because of deep structural changes and/or distortions brought about by the Great Recession of 2008. As it is, most long leading indicators bounced smartly off their respective troughs meaning that even if the NBER were to declare recession, it would be the shortest and mildest on record. 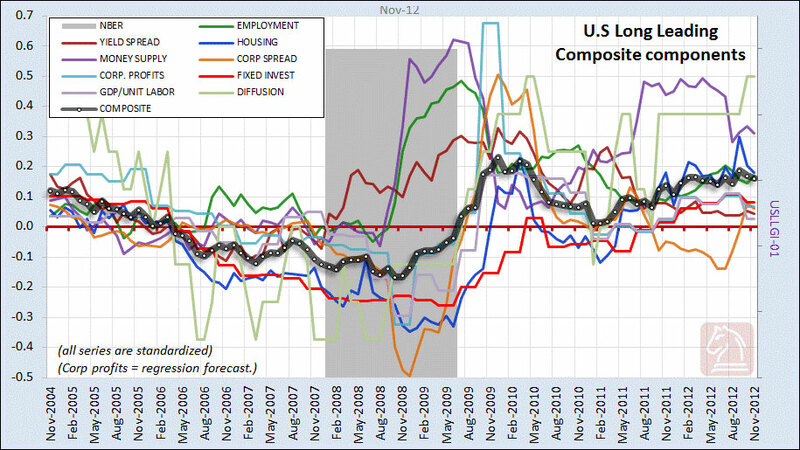 However, should conditions have continued to deteriorate a little further for the long indicators, it is quite feasible that long leading recession models heavily reliant on yield curves, treasury spreads and unemployment rates would have completely missed the recession call due to their falsely bullish readings. Failure to make allowances for these structural changes can therefore be hazardous to your recession forecasting efforts. RecessionALERT has conducted extensive research into long leading models and have settled on 8 diversified indicators (plus their diffusion) borrowed from various academic research methodologies in addition to those of the late Prof. Moore and new techniques and discoveries made by ourselves. 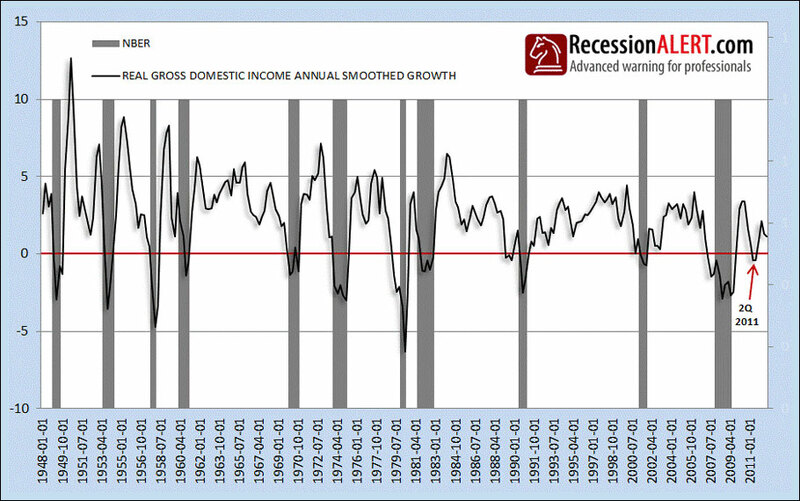 These have all consistently peaked 9-18 months before the onset of recession. We have done all the normal statistical tests for data mining and revisions sensitivity as per the comprehensive testing done for our NBER Model and are satisfied we have something that is robust and can be trusted on the 9-12 month long leading side. In fact we track two models, one inclusive of Fed directly-influenced items and one without. Sensitivity tests have demonstrated that up to any combination of up to 5 of the indicators can be completely removed from the equation or suffer 25% deviations from reported figures and still not influence the outcome of the composite (only modifying the leads and introducing the odd false positive). The composite is equally weighted and is mapped out below. Even though our interpretation of the FED components have been sanitised of about 80% of their extreme manipulations on the long end of curve it still shows the model sans FED influences (“NOFED” model) being far less optimistic than the FED inclusive model. Our long leading model issued an alert around January 2011 (when NOFED dipped below zero growth) and given its average lead time of 12 months, implied a recession by January 2012, some 3 months after ECRI issued their first “imminent recession” call (which was subsequently revised to much later over time.) It is now 2 years after that trough and we still maintain we are not in recession yet. As we follow the black line when it comes to recession calling, you can see the long leading indicator just bounced above zero, narrowly missing the recession threshold, and making strong gains thereafter. We have deployed our own versions of a Labor market Index, a Housing Index, the Treasury Yield spread and Monetary supply all of which have suffered “structural distortions” or “extreme manipulations” since 2008. The versions of these components we have developed have been hardened against structural changes, providing near identical signalling to the standard components pre- 2008 and adequately sanitising them post 2008 from structural effects of the Great Recession (removing long-term unemployment components and compensating for labour force participation rates and manipulations by fed on long end of curve for example) The behaviour of these and other components of the model around the last recession and current expansion are shown below. You can see that Residential Fixed Investment, Housing, GDP per unit-labour cost and corporate profits all paid a visit below the recession trigger between August 2010 and May 2011 effectively dragging their Diffusion Index (which tracks how many systems are in recession territory) into recession territory as well. However the other components kept the black line from going underwater. We believe any long leading index should have signalled a near-miss recession 9-18 months ago. Why? Because the ultimate co-incident index, Quarterly Gross Domestic Income (in addition to our NBER model) shows we narrowly escaped recession. We prefer the GDI model since its accuracy is known going back to post war period of 1948 and quite a bit of academic research has shown it to be a superior expression of the economy than GDP. We are certain ECRI lean heavily on GDI as an expression of the economy coincident as opposed to GDP and the chart below probably had a lot to do with their “imminent” recession call in late 2011. But if we narrowly missed recession, how come so many traditional long leading indicators didn’t even come close to flagging it? The answer is structural changes. The easiest examples of these are with the Treasury spreads and the labor market. 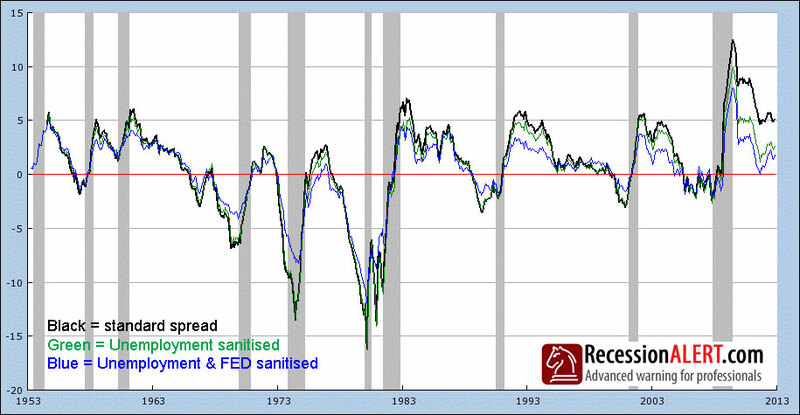 As an example of the dangers of deploying long leading models using components subject to structural distortions of the Great Recession and extreme FED manipulation, consider a simple 2-factor long leading composite constructed from real unemployment (unemployment deflated by CPI) and the spread between 10’s vs. Fed Funds rate. Below are 3 versions of the model, black being the standard model and green being the model sanitised for structural unemployment changes and blue being the model additionally sanitised from extreme fed influences on the long end of the curve. So we see that a traditional interpretation of this model, which by the way has an excellent track record in the past for providing 9-12 months lead to recession, provided a far more optimistic view on its last big trough than the blue line which indicates we actually had a narrow miss. So it is clear you have THREE MODELS that near identically signalled long leads to recession up to 2008/9 and now diverge considerably post 2008/9. They are thus mathematically and statistically ALL VALID MODELS for consideration and therefore, ignoring the reading of the less optimistic models would qualify as a huge oversight. As you can see the 2nd sanitised version signals a recession near-miss whereas the first traditional model incorrectly implies ECRI’s call was way, way off mark. Now do you think someone with ECRI’s reputation and stakes in the game would really have missed by such a huge margin as implied above by the black line? We think not. Simplistic tried and tested low-order models with near perfect track records are thus subject to non-trivial risks of future missed calls unless some compensation or risk bands are included to compensate for structural changes of the Great Recession and overtly aggressive fed policies. This is why we prefer deployment of 8 diversified components plus their diffusion, hardened from distortions, to ensure any component unduly affected by said distortions do not present misleading optimistic readings. Assuming ECRI was following a model that maybe dipped below their red line for whatever reason,you can forgive them somewhat for their initial assumptions. In hindsight the call seems out of whack but on the day when the index was hovering below recession trigger on a cliff like downward trajectory and no foresight into the eventual bounce shown on above chart it becomes easier to understand the call. As we have stated on prior occasions, 9-12 month lead times for recession are not very useful (See “Recession – Just how much warning is useful anyway?“) and we prefer to rely on many other medium, short leading and co-incident models when it comes to inferring stock market actions. You can see recent sample reports from all of them over here. What we will do however is take any recession signal given by these shorter lead models and then confer with the Long Leading model to ensure things tie up.